The Ferruginous Hawk is the largest and heaviest of the buteo hawks. Like many owls and other raptors, the Ferruginous Hawk’s nesting and fledgling success are very dependent upon the food supply in the nesting territory. In fact, if food is scarce, a pair may not nest at all. Ferruginous Hawks are one of two "booted" types of hawks in North America. 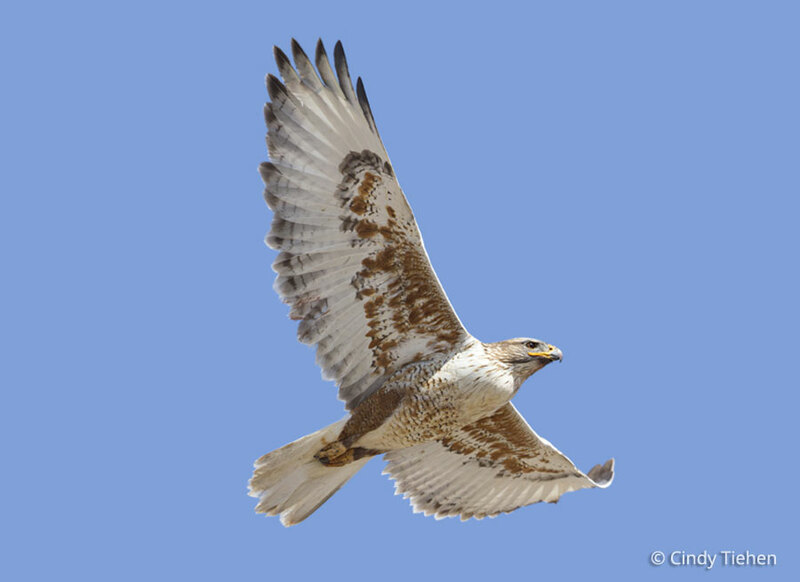 Like the Rough-legged Hawk, the Ferruginous Hawk's legs are covered in feathers all the way down to its toes. 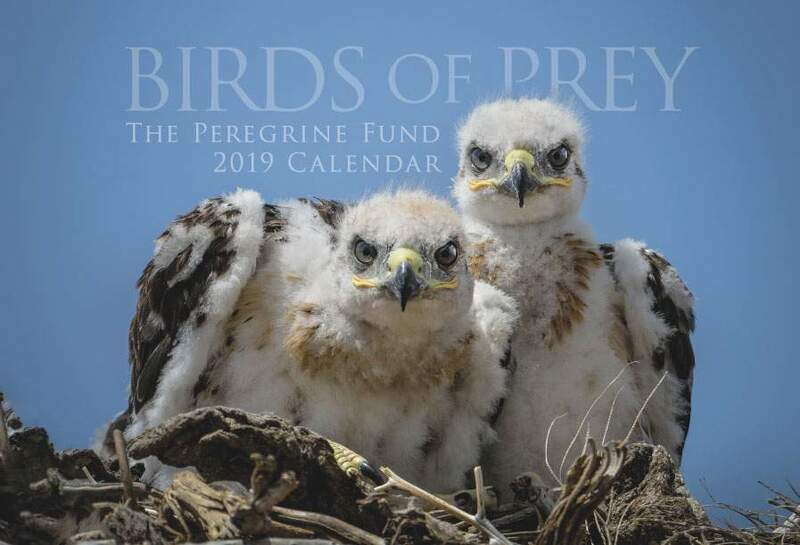 Though The Peregrine Fund doesn't work directly with Ferruginous Hawks, our efforts in scientific research, habitat conservation, education, and community development help conserve raptors around the world. We also supply literature to researchers from our avian research library, which helps scientists the world over gather and share important information on raptor conservation. The Ferruginous Hawk is strictly a North American species. It is found from southwestern Canada, through the western United States, and into northern Mexico. This hawk lives mainly in open country, including dry prairie, sagebrush, and steppe-deserts with short vegetation containing large populations of small mammals. it is often found on plowed fields and other cultivated lands. This hawk is migratory, but unlike the Broad-winged Hawk, it travels relatively short distances between its breeding and wintering grounds, traveling mainly between Canada, the U.S. and Mexico. Though Ferruginous Hawks are named for the ferruginous (rust color) on its wings, this species actually comes in two different color morphs. Light morph individuals have palish grey heads, rufous colored barring on the breast, rust-colored thighs, and grey and rufous wings. Dark morph individuals are generally dark all over. 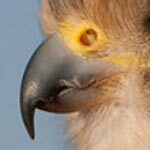 All Ferruginous Hawks have a large head and a distinctively wide gape. Adult males and females have identical plumage patterns. The best way to tell them apart is by size. As in most raptors, the female is larger than the male. In some areas, the numbers of Ferruginous Hawks closely reflect cycles in rodent or jackrabbit populations. This means that when there are lots of these prey animals, there are more hawks in the area, which makes perfect sense. Fewer prey items equals fewer individual hawks. Some may need to leave the area to search for food, others may simply not get enough to eat and may starve. The Ferruginous Hawk is a large and strong raptor, capable of holding its own. Even so, it sometimes falls prey to other raptors including Golden Eagles. There has been concern about the health of populations of the Ferruginous Hawk in several parts of its range in recent decades, owing mostly to ongoing habitat loss. Loss of uncultivated land and the prey base that it supports (due to change in habitat, shooting or poisoning of ground squirrels and other small mammals) limits the breeding success of this species. So much so, in fact, that some pairs may even fail to attempt breeding in years, or areas, of food scarcity. In addition, this species is more sensitive than most raptors to disturbance at the nest and is prone to nest desertion -meaning if there is too much noise or other activity around the nest which stresses the adults, they may simply pickup and leave the area. Though some Ferruginous Hawk populations seem to be growing, there is still concern for the future of this species. It is categorized as "Least Concern" by BirdLife International, however the Committee on the Status of Endangered Wildlife in Canada (COSEWIC) upgraded the status of the Ferruginous Hawk from Special Concern to Threatened in April 2008 because of a 64% decline in the Alberta population over a time period of about15 years! Like many raptor species, the Ferruginous Hawk has a varied diet as well as varied means for catching its prey. The top items on this raptor's menu are small to medium-sized mammals, such as hares and rabbits, to gophers, kangaroo rats, antelope squirrels, deer mice, and ground squirrels. They will also feed on passerines (small birds), reptiles, amphibians, and even insects. 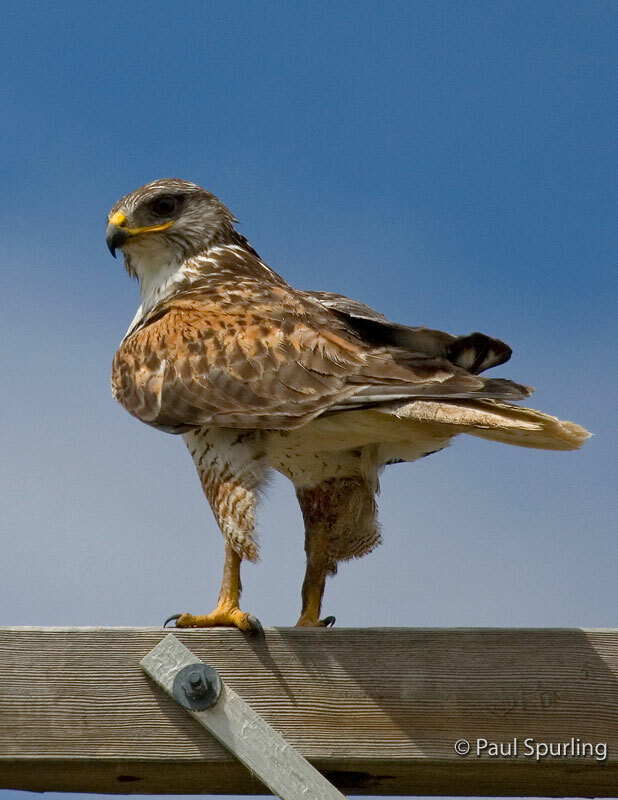 In order to catch its prey, the Ferruginous Hawk will use a variety of different hunting techniques. It might hunt from a perch, where it will sit and wait wait for prey to pass by. Or, it will hunt in a low searching flight, dropping on to prey from above. It will sometimes hunt from the ground, pursuing its prey on foot, or pouncing on it with a short hop. They have even been known to hang out in front of rodent dens, waiting for the unsuspecting animals to emerge. The Ferruginous Hawk builds large stick nests in trees or bushes, on cliff ledges, power poles, hay stacks, dirt piles, man-made structures including windmilss and power poles, and even on elevated spots on the ground. It lines its nest with grass, bark, and even cow chips! Similar to the Osprey, the Ferruginous Hawk has strange taste in nesting materials - often using wire, plastic, paper or other rubbish in the nest construction. The female may lay from 1-8 eggs, but she usually lays between 3-5 eggs. Both parents help care for the eggs which need to be incubated for a little over a month, or around 32-33 days. When the chicks hatch they are covered in fluffy down and are totally dependent on their parents for food and to help them regulate their body temperature. The adult must sit on the young chicks for the first week or so, to help make sure they don't get too hot in the middle of the day, or too cold in the night. The young will grow and develop fast. In as little as 5 or 6 weeks, the young birds will be fully feathered and ready to fly from the nest for their first time. However, some young leave the nest prior to fledging, by walking out onto the branches or ledge of the nesting site. Fledglings will spend the next few weeks in their parents' territory as they learn to hunt and survive on their own. After they leave their parents, they are completely dependent and must be able to find enough food and avoid dangers such as predators, in order to survive and be able to breed when they are old enough. They reach sexual maturity at about 2 years of age. Though a limited number of Ferruginous Hawks live year-round in the southern-most part of Idaho, most do not live here year-round. Instead, they return each year during breeding season, usually arriving in late February or early March. According to the Idaho Game and Fish Department, there are around 600 breeding individuals in Idaho. The hawks are mostly found in the Snake River Plain, not far from The Peregrine Fund's World Center for Birds of Prey! 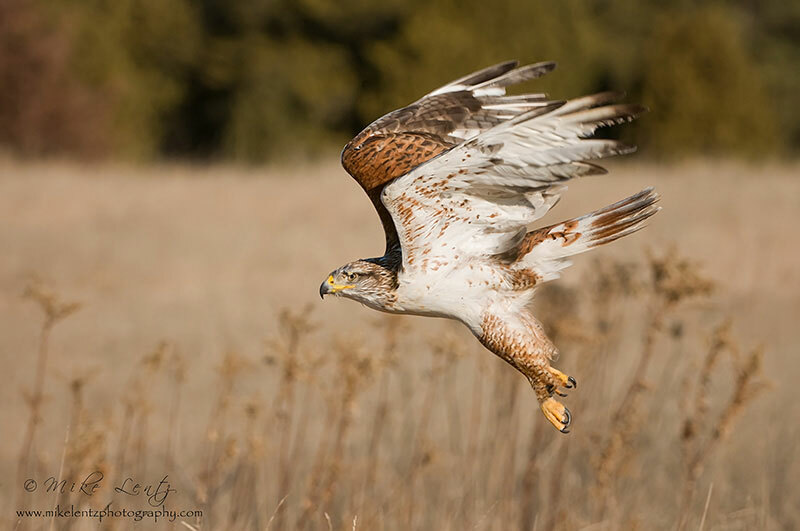 In Idaho, the Ferruginous Hawk is threatened primarily by conversion of native grasslands into cultivated fields. 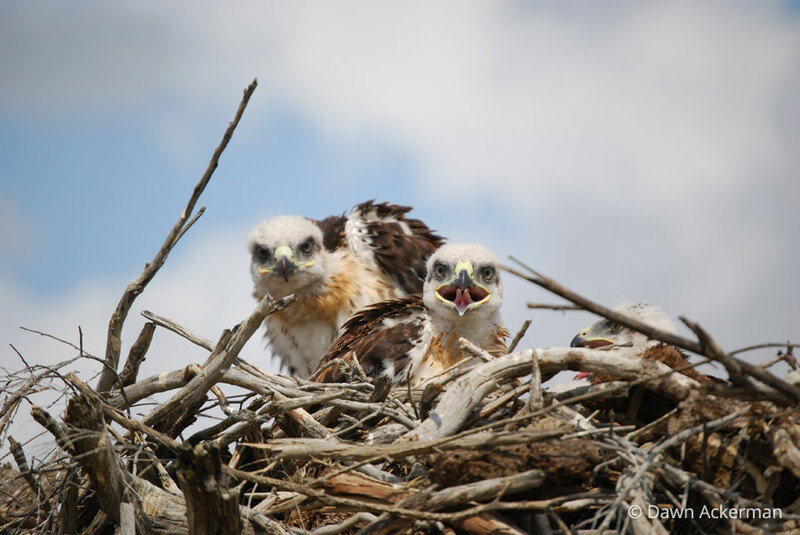 According to the Fish and Game Department, almost 50% of Ferruginous Hawk habitat in southern Idaho has been lost, and local biologists are noticing a decrease in their numers. The World Center for Birds of Prey offers fun ways to learn about raptors. The visitor center has interactive displays, tours, interesting videos and a children's room with activities from coloring sheets to quizzes to costumes and a touch table for the curious mind. 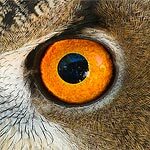 Knowledgeable staff and volunteers are on hand to answer any questions you may have about Ferruginous Hawks or any other bird of prey.